In the 2nd edition of this successful introductory nutrition text, educators Jamie Pope and Steve Nizielski use real stories—about real people and real science—to teach the basic concepts of nutrition. Each chapter exemplifies the book’s thoroughly contemporary approach to nutrition science. The 2nd edition has been revised and updated to meet the needs of the contemporary student. 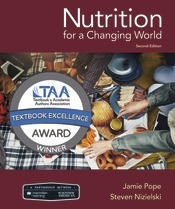 Nutrition for a Changing World is an essential purchase for students of nutrition and dietetics, and also for those students who major in other subjects that have a nutrition component, such as food science, medicine, pharmacy and nursing. Professionals in nutrition, dietetics, food science, medicine, health sciences and many related areas will also find great value within its covers. Nutrition for a Changing World is the only textbook for the course to offer automatically graded dietary analysis activities. These exercises are in LaunchPad, our dedicated online course space that compliments the text to provide students with a fully integrated print/digital learning experience. Students bring many misconceptions about nutrition to the course-- non-science majors (Gen. Ed students) think the course will be easy and aren’t prepared for the science content. In many classes, students have varying levels of prerequisite science background. In this new edition, shorter lucid chapters provide flexibility for instructors and emphasize topics that are important to students, providing motivation and correcting misconceptions. New and updated topics, along with an emphasis on active learning, assignable content, and integrated resources that help you advance your knowledge. Classes can be very large and grading of assignments is a challenge for instructors. We have partnered with ESHA to provide ‘Track My Diet’ for the diet analysis reports in LaunchPad and created automatically graded activities in LaunchPad.